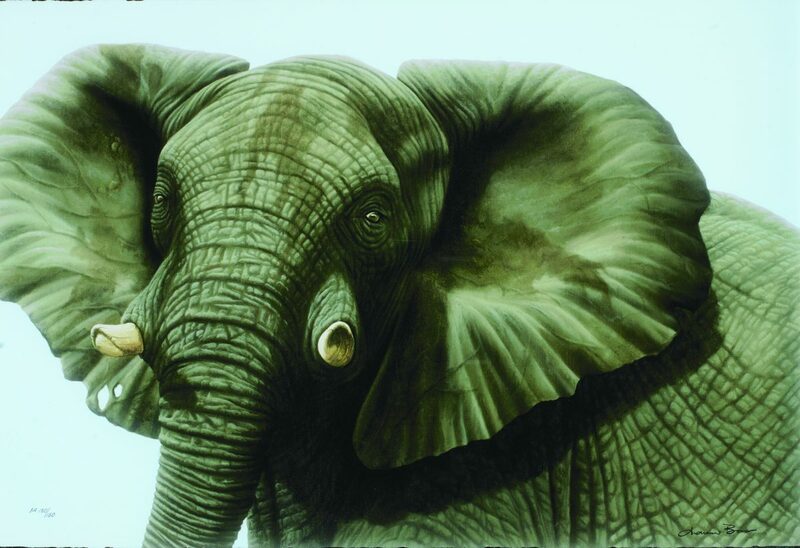 Artist and conservationist Andrew Bone captures the wildlife and landscapes of his native Africa through his exciting, photorealistic artwork based on his own firsthand experiences and photographs. Bone regularly travels throughout southern Africa for inspiration. 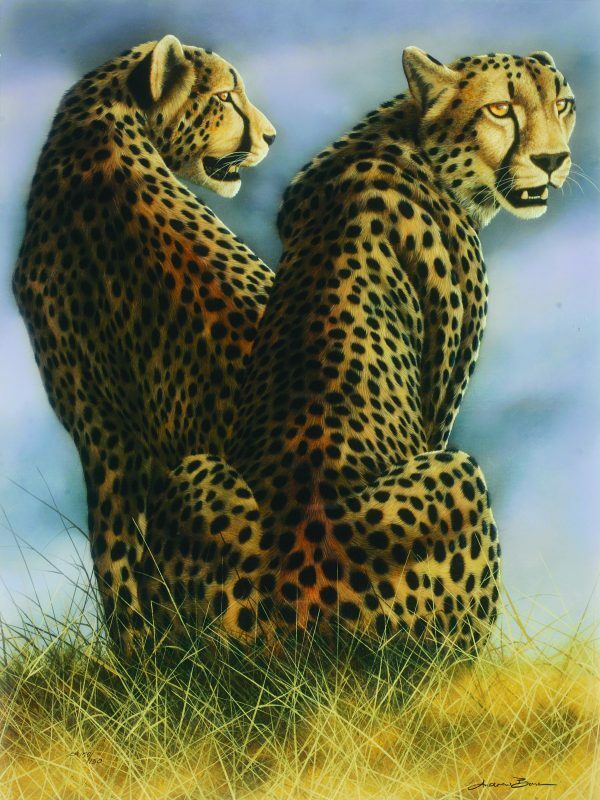 His work is collected around the world by art and animal lovers with an appreciation for precision and realism. Bone was born in Harare, Zimbabwe in 1957. At the age of 13, Bone attended Falcon College—a bush school for boys in Zimbabwe (then southern Rhodesia)—where his deep love and respect for African wildlife began. After graduation, Bone completed a mandatory assignment in the country’s National Service, fighting in the Rhodesian War. During his time in the military, he was introduced to Zimbabwe’s Zambezi Valley, which would become an integral part of his life. Zambezi Valley is home to many species of animals, including lions, elephants, hippopotamuses, impalas, zebras, and buffalo. When a friend established a canoeing company in the Zambezi Valley, Bone became a guide with the company, helping visitors explore and experience the region. After marrying his wife, Kelly, Bone relocated to Zimbabwe’s Imire Game Ranch. Inspired by the surrounding wildlife, Bone began painting—completely self taught—the flora and fauna he regularly encountered. His work quickly became popular with local art galleries, which eventually allowed him to work as a full-time wildlife artist and conservationist. Bone, his wife, and their three daughters live in the mountains of southern Africa. His studio is the hub of the family’s home and is filled with everything from mechanical parts needed for his expeditions to animal jaw bones and skulls. Nonetheless, Bone’s studio is his refuge. As a conservationist first and an artist second, Bone prefers to spend his time in the African bush. 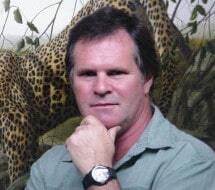 The relationship between his two careers is a happy one, which allows Bone to promote wildlife conservation and introduce people all over the world to Africa’s biological diversity through his art. As an extension of his passion, Bone also uses his art as a fundraising tool. In 2014, he established The Forever Wild Foundation, where 100 percent of funds raised go directly to wildlife protection charities. His technique begins with his camera. He packs his Land Rover for the day, goes into the wild, and photographs everything. He claims that he’s as excited to study a dung beetle as he is a charging herd of elephants. “Everything in nature is interdependent. The survival of each species is as important as the other and has a role to play—therefore each is entitled the same respect and curiosity,” Bone says. Once Bone is back in his studio, he analyzes his photographs but finds his true inspiration on the easel. Although he does not copy a photo precisely, he maintains the acute anatomy of each species, which allows him to paint each animal exactly as it appears in the wild. Bone occasionally runs into danger but wouldn’t have it any other way. He’s woken up to lions breathing over him, been chased up a tree by a buffalo, and tipped out of a canoe by a hippopotamus. Although he’s seen many good friends killed in the bush, he claims he’d rather become “hyena bait” than spend his last days in a wheelchair. Taking up to four weeks to complete, there are no shortcuts in Bone’s paintings. Paintings will remain in his studio for a long time not only due to his technique, but his passion for perfection. Bone calls himself a “control freak” and meticulously plans where he travels, which photos he takes, and ultimately, what subjects he paints. As a general rule, Bone only paints the species of Africa. Collectors have requested for him to paint wolves or black bears, but he declines, saying that he wouldn’t attempt to paint something he hasn’t studied firsthand. His exception to this rule is the tiger. As a conservationist, he hopes to bring attention to this endangered species by painting it. 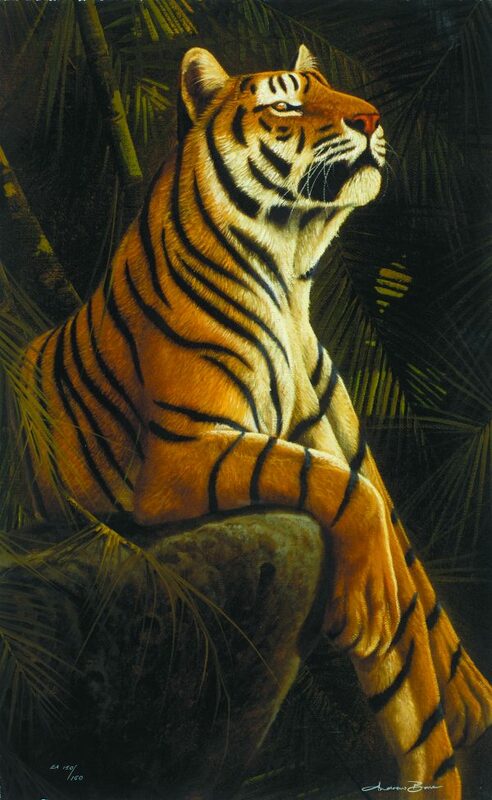 As an artist, he is intrigued by the animal’s beauty, and finds it challenging to perfectly capture its distinct striping. In 2014, Bone established The Forever Wild Foundation, a non-profit that uses in-kind resources to support the conservation of African wildlife. Through the Forever Wildlife Foundation, Bone’s conservation efforts have helped implement four wildlife-focused projects, including the Boma Project, the Painted Dog Project, the Cheetah Project, and the Lion Project. These projects help to rebuild or sustain specific at-risk animal populations in Africa. Bone’s passion for conservation and art influenced his 2015 memoir “Brush Strokes of Africa,” which tells the story of Bone’s upbringing and his journey to becoming an internationally acclaimed wildlife artist and conservationist.